The furthest travelled member attending the Annual General Meeting of the Club in Maranello this year was Tim Schenken who flew in from his native Australia. Not only is Tim Schenken a greatly under-rated racing driver but when he finished his career in racing he went on to join his great friend New Zealander Howden Ganley to become a racing car manufacturer (Tiga) but in recent years has applied all his racing knowledge and experience into putting something back into the sport as Director of Racing for CAMS, the Australian motor sport authority and is Australia’s FIA representative in Paris. Earlier this year he was given the Order of Australia medal in Queen Elizabeth II’s birthday honours. For Tim the interest in racing came at an early age. “When I was about eleven or twelve years old I had a friend at school, Paul Bernadou whose father Leon did a bit of racing. I went to a hill climb with him and from that point on all a dreamed about was being a racing driver. I read all the racing magazines, Autosport, Motor Sport, Motor Racing and Stirling Moss and Jack Brabham were my heroes. I built a little go-kart at that age with a Villiers two-stroke engine. Leaving school early I joined a motor dealership and was a “mechanic”, before moving into administration. Tim’s first proper racing car was a Formula Junior Lotus 18 he bought with financial help from his father who worked in the textile business with Felt and Textiles. At a race at Warwick Farm, where he was driving the Lotus, he was approached by one of Australia’s best known racing drivers of the time, David Mackay, who asked him what his plans were and advised him to go to Europe. So at the end of 1965 he took a long boat trip from Melbourne to Southampton in England and once there followed the usual Aussie route and found his way to Earls Court in London which was a warren of Australians. Now he needed money so he went to see Graham Warner at Chequered Flag, which dealt in racing cars as well as road cars, and got a job as a mechanic. The 1968 season firmly established Tim Schenken as a man to watch. Indeed, not only did he win over thirty Formula Ford races with his Merlyn but took up an offer to race in Formula Three. Few racing drivers today would accept a racing schedule such as Tim had that season. He often ran four races at one meeting on Saturday ( Two Formula Ford and two Formula 3) but then dashed across country to race elsewhere in another four races on the Sunday; but it paid off with 48 wins out of 67 starts in the two categories. He even ran the Merlyn at Spa in Belgium where he explained that he only needed to touch the brakes four times on the high speed 8.7 mile lap. Tim was to remain in Formula 3 for two more seasons. In 1969 Jack Brabham and Ron Tauranac offered him the factory drive in the new Brabham BT28 and Rodney Bloor supplied the engines and mechanic. In those days there was no transporter culture in Formula 3 and Tim and his mechanic used to tow the race car with a Ford Zephyr with no back seat or bulkhead so they could carry the spare wheels, gear-ratios, some suspension parts and a nosecone. In the boot was a spare engine and on the trailer was the car! 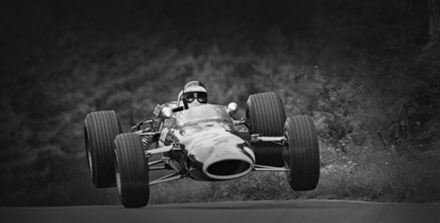 He could not have chosen a tougher period as 1969/70 were the years we saw some of the true greats like Ronnie Peterson, Emerson Fittipaldi, Francois Cevert and Patrick Depaillier starting out. However, even in such company Tim had a good season with a number of wins against his good friend Ronnie Petersen, notably at Crystal Palace where they battled for the lead for the entire race. The obvious next step was Formula 2 and again Brabham came up with a chassis for 1970 and, with the help of Castrol, Rodney Bloor bought an FVA engine. Now Tim was up against the grand prix heroes of the period like Jackie Stewart and Jochen Rindt who ran Formula 2 in those days. 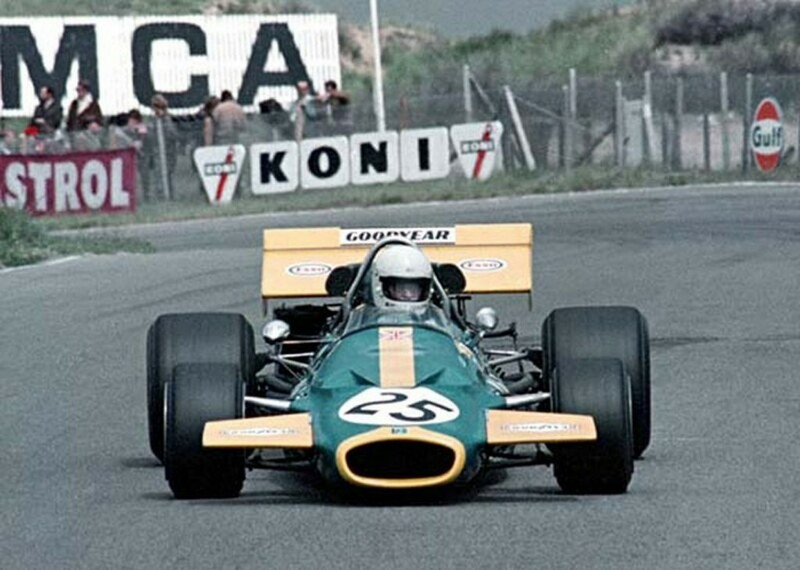 At the opening round of the European F2 Championship held at Thruxton Tim finished second to Jackie Stewart in John Coombs’ Brabham BT30 in the first heat and at Pau he took a strong third place behind Jochen Rindt and Henri Pescarolo. It was not a good season, however, and when Piers Courage was killed in Frank Williams’ De-Tomaso grand prix car Tim contacted Frank about a drive. 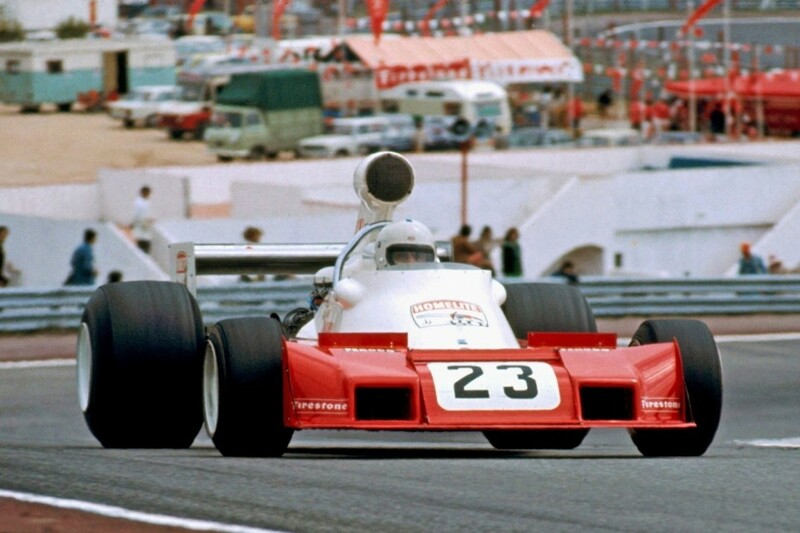 Williams, however, chose Brian Redman for two races but the car did not run. Frank Williams came back to Tim regarding the Austrian Grand Prix at Zeltweg and it was where Tim made his World Championship Formula 1 debut. The de Tomaso was one of the first cars designed by former Ferrari engineer Gian Paolo Dallara. Sadly it was drastically uncompetitive and though Tim managed to qualify the car three times he struggled with it. Ironically in his first two races in Austria and at Monza it was the engine that let him down. He recalled Monza with great sadness “ Jochen Rindt was a great hero of mine and it was here, in practice, that Jochen was killed. It was actually quite surreal for me. In Canada he finished but was unclassified and his final race of the season at Watkins Glen was another disaster when the rear suspension collapsed. It had been a pretty disasterous entry into Formula 1 but things looked more hopeful for 1971. “At the end of the year ( 1970) Jack Brabham retired and handed over to Ron Tauranac and Ron offered me a Formula 1 drive with Brabham alongside Graham Hill. At that time Brabham had a young and progressive mechanic by the name of Ron Dennis and at the end of the 1970 he and Neil Trundle founded the Rondel racing team with the contract to run two of the new Brabham BT36 Formula 2 cars as the official factory team. Graham Hill and Tim Schenken were the drivers and both made their debut at Thruxton . Things looked good with Hill winning the final and Tim fifth. 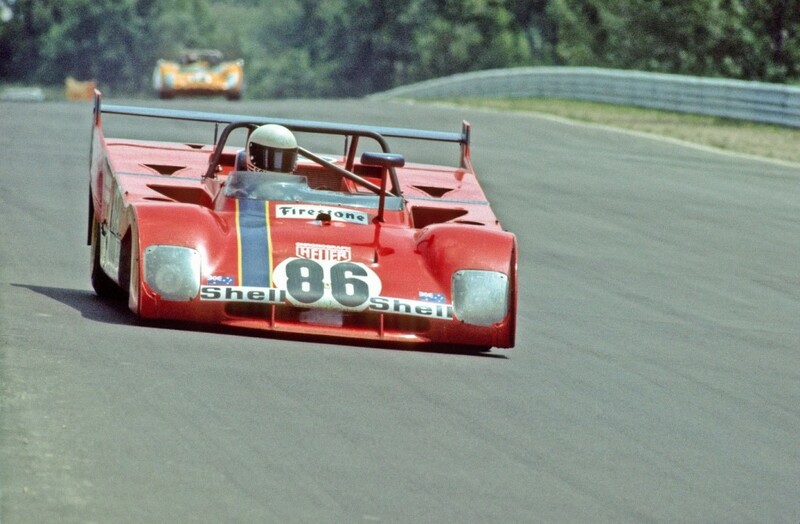 Tim’s racing career also took a completely different direction during 1972 because at the 1971 Italian Grand Prix an Italian girl came up to him in the paddock and said that if he was interested in driving for Ferrari in sports cars to come down to the Ferrari truck. 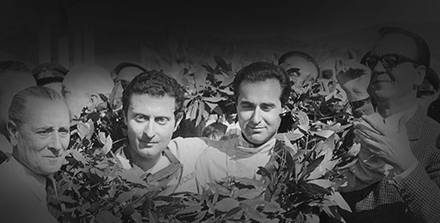 Which he did.” I honestly thought it was a joke that Ronnie Petersen or Emerson Fittipaldi had set up so I eventually went over to the Ferrari truck only to find team manager Peter Schetty in a fluster as Enzo Ferrari himself had been driven to Monza and was waiting to see me in the hotel outside the circuit. “What surprised me was that we actually did the deal sitting in the restaurant. “ I was to do nine long distance races and would be driving the Ferrari 312P. But then we came to payment. 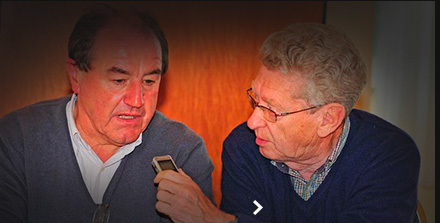 I suggested £2000 a race which was pretty good back in those days and Mr Ferrari agreed on the spot. So despite the disappointments of his Formula 1 season with Surtees Tim’s successes in sports cars with Ferrari and Formula 2 with Rondel – where he finished 4th in the Championship kept him on the radar, so to speak..
Ron Dennis’s proposed Formula 1 car, also designed by Ray Jessop, was shelved due to the results of the oil crisis and diminishing sponsorship opportunities so the entire project was sold and later became the Token grand prix car. As a result the 1973 season proved to be a rest year and Tim’s only grand prix race was a drive in the Canadian Grand Prix with Frank Williams’ ISO-Marlboro; not the most successful grand prix car. It was no surprise when he finished well down the field in 14th place. The Formula II Motul’s were launched at Hockenheim in April but Tim and his Motul team mate Jody Scheckter collided on the warm-up lap which put them out of serious contention. Tim was now an A graded driver and so could not score points in the championship but he had some good results. With Ferrari he had a little more success with two second places at Vallelunga and Monza but all told season 1973 was one to forget. One could almost say the same for 1974 because he was signed by Peter Agg to race his new Trojan Formula 1 car designed by Ron Tauranac. It was a very simple car with split nose radiators and the ubiquitous Cosworth V8 engine but in seven starts the car only finished three times; and then in lowly places save for 10th place in Austria and Belgium. The Trojan programme came to an end after the Italian grand prix. Colin Chapman, however, offered Tim a drive in the US Grand Prix at Watkins Glen with the unloved Lotus 76 whereas team leaders Ronnie Peterson and Jacky Ickx reverted to the Lotus 72 which was some seasons old by that stage. Tim had a difficult time in practice with the Lotus and just could not get to grips with its handling ended up last on the grid and second reserve for the race. Jose Dolheim, the first reserve, got to start as Andretti had problems on the grid but Tim set off in the race anyway and was promptly black flagged. As we now know it was the end of his Formula 1 career but he went on to much greater success in Sports cars and in particular Interseries with the formidable Porsche 917 run by George Loos. He won the 1000kms at Nurburgring with a Porsche 935 and then raced a Ralph Broad Jaguar XJ12C in the 1977 European GT Championship. However, by now Tim and his close friend Howden Ganley, presumably looking ahead, had formed their own racing company TIGA and started by building a Formula 3 car. With backing from Marlboro and Tim running the team they provided Andrea de Cesaris with a car for the British Formula 3 Championship. Howden Ganley was the guiding light at Tiga but they built cars for almost all the feeder Formulae from Sports 2000 to Formula 2 and in total produced over 400 chassis. However Tim tired of life in England so with wife Brigitte and his children, he decided that it was time to go elsewhere which turned out to be San Diego. When there Tim ran John Fitzpatricks Porsche team but the lure of Australia was still there and when CAMS, the Australian motor sport authority, offered him his present role as an administrator he jumped at the chance. That was in 1984 and now, thirty-three years later he has built up and strengthened CAMS with all his racing and manufacturing experience. 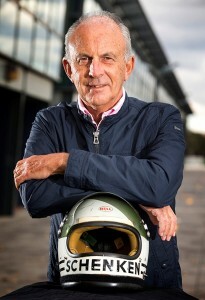 He was Clerk of the Course for the Australian Grand Prix in Adelaide in 1985 and has maintained that role in the Australian Grand Prix ever since. 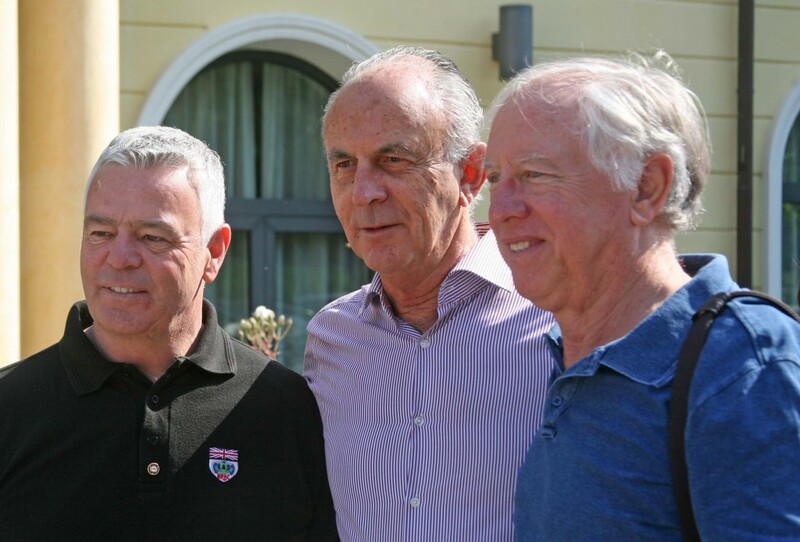 Tim, centre, back in Maranello at the Grand Prix Drivers Club annual meeting with Derek Warwick and Vern Schuppan. As Tim says, you cannot do any administrative job and hope to be popular with everyone but certainly Tim Schenken can be proud of the fact that he has now spent more time serving the sport he loved as an official in the background than he ever did as a racing driver and for that he deserves all the plaudits he receives. All rounder? That’s Tim Schenken.